"Crystal Blue Garden" A set of 6 crystal base color beads decorated with dark aqua, light aqua, medium blue with cobalt center, translucent green and transparent green flowers. The single bloom is a transparent dark aqua measuring about 21mm across. Each round bead is about 12-15 mm . 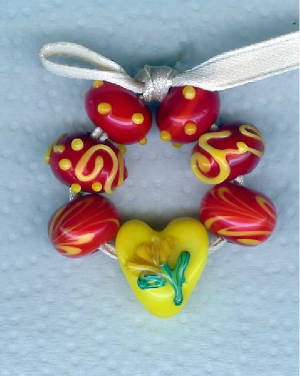 Price: $28.00 for the set of 7 beads. 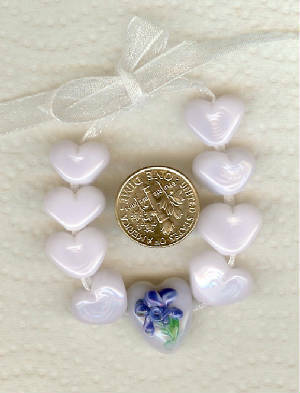 "Lavender Hearts": A 15mm lavender heart with a blue orchid. Also 8 unadorned hearts approx. 12-14mm. Price: $14.00 for the set of 9 beads. "Imperfect Flowers" I'm cleaning out the bead box. Tube beads, round beads, slightly out of round beads. Test flowers and colors. Have fun playing with these orphans. Price: $20 for the string of 10 beads.